Have you ever been knee-deep in a series on your DVR when someone manages to spoil the ending for you? Yeah, me too. It’s frustrating. If you’re anything like me, you like to savor each show at your own pace. Sometimes that means watching one show now and others later. Other times it means binge-watching multiple episodes at once. When the ending is spoiled for me, I feel like throwing in the towel. That concept isn’t lost on TV shows, movies and sporting events. It applies to real escape rooms and games as well. 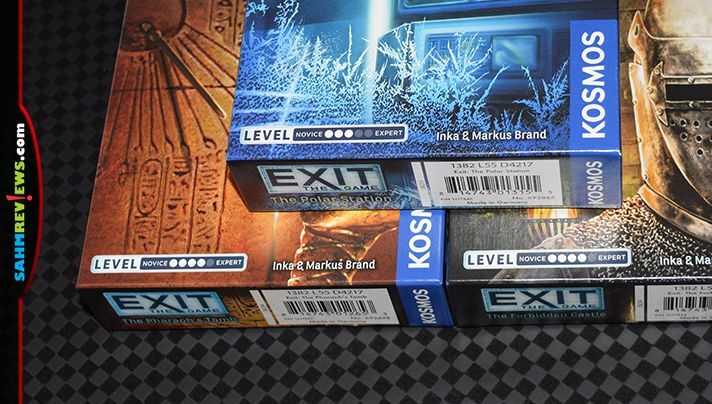 As is the case with the escape room style EXIT series of puzzle games by Kosmos. The purpose of this overview is to tell you about the games and the series, but I need to tread lightly because I don’t want to give anything away. We’ve played several in the series and no two have been alike. I’m not only referring to the theme (which is also different in each game) but specifically the types of clues and how to decipher the puzzles are completely different. They have incorporated such unique clues into the game that it’s important to select individuals who have not experienced a particular title in the series. 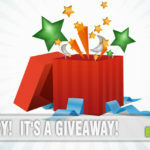 Otherwise, they might inadvertently give away a jaw-dropping clue and your team will miss out on the fun of figuring it out yourself. Trust me. We’ve caught ourselves incorporating some of these unusual methods when playing others in the series! Each box is slightly larger than a paperback book so they don’t take up much space on a bookshelf. But don’t let the small stature fool you. 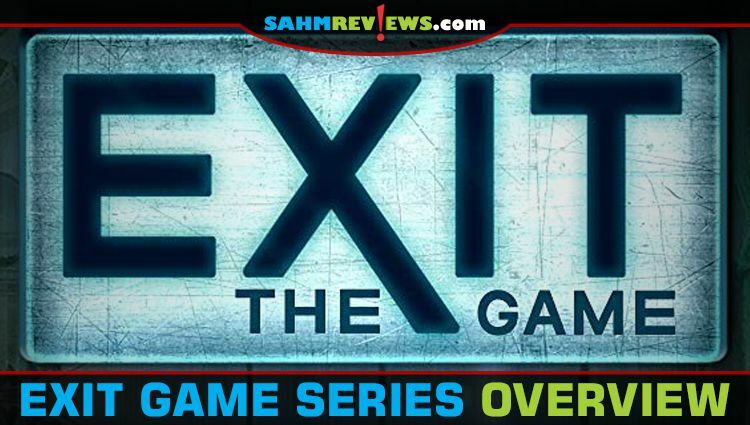 The system used for the EXIT game series is robust enough to fit a couple hours worth of play in each game. 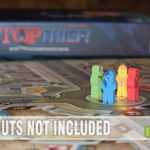 Inside each you’ll find a decoder disk, multiple cards, a book, a rule book and some starting pieces that may or may not be clues. Don’t worry, there’s more to it than that. You’ll uncover clues as you go. Each puzzle is identified by a shape which corresponds with a starting map or image as well as a column on the decoder disk. What is unique about this game is the process by which you make discoveries. 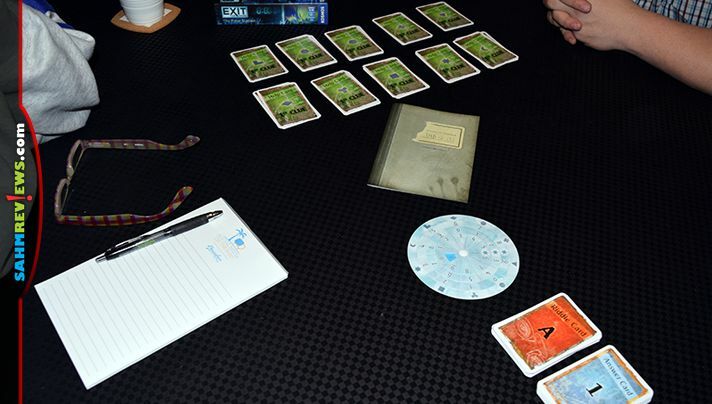 You have a stack of answer cards as well as multiple clue cards. If you’re stuck, you grab the first clue card related to the “shape” of the puzzle you’re stuck on. It will give you an easy tip to help you out. Still stuck? Grab the next clue. Your final score will be determined not only by how quickly you complete the puzzle but also how many clue cards you used as crutches. 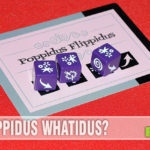 When you think you know the answer, you use the decoder wheel to match up the answer and it will tell you a card to pull from the Answer Card deck. If you’re definitely wrong, the card will tell you. If you’re possibly right, the card will ask you to match the “shape” to the picture in the book. That will direct you to another card that tells you if you’re right. 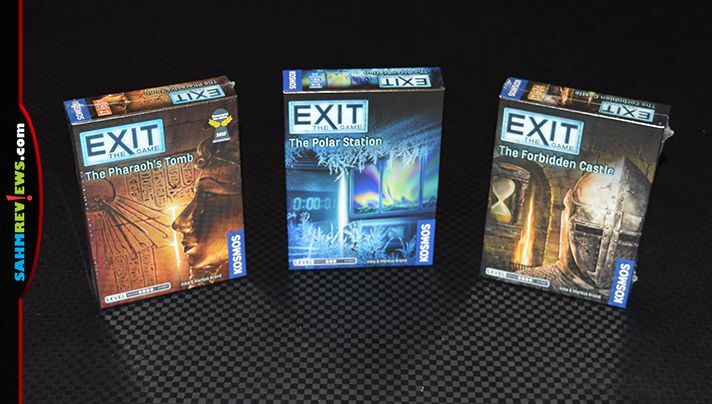 As I mentioned, we’ve played previous titles in the series, but the three most recently added to our collection are EXIT: The Polar Station, EXIT: The Forbidden Castle and EXIT: The Pharaoh’s Tomb. In EXIT: The Polar Station, we were locked inside a research station in the Arctic when the evacuation alarms went off. We were tasked with figuring out how to get the door unlocked before time ran out. The Forbidden Castle is set in a medieval castle that is filled with riddles. We were locked inside the throne room and an the goal was to solve the riddles to escape. Any guesses what the scene of EXIT: The Pharaoh’s Tomb might be if you decide to take on the challenge? Yup. Egypt. You were separated from the tour group during your vacation and get locked inside a burial chamber! It takes a dusty notebook left inside the tomb to help decipher clues and… EXIT. 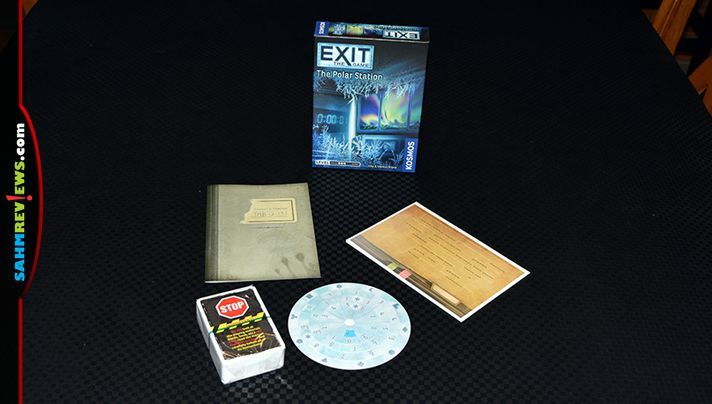 Each game in the EXIT series should be looked as one and done because you typically have to alter or manipulate the clues to be able to solve the riddles. Look at it like a movie where you’re paying admission of less than $15 for an evening’s worth of entertainment for up to 4 people. Don’t worry, there are multiple games in this series so there’s plenty of opportunity to come back to the table for another experience. And trust me, you’ll want to! As of this writing, there have been 10 in the series. You can visit the Kosmos website or see the selection on Amazon. Of course, you can also decipher clues on their Facebook and Twitter channels to see what is coming next. In addition to the unique theme, each comes with a difficulty rating. If you’re new to the series, start with the easiest one. Really. I’m not kidding. No matter how good you think you are at puzzle games, you should start with the easiest to get a feel for how the EXIT game series works. Then when you open the next, you can (mostly) throw what you learned out the window because the next one will be different. And harder. And nothing like the first one. You may fancy yourself a puzzle fanatic and wonder why I’m telling you to start with an easy one. Spoken as someone who has thrived at puzzles throughout her life and joined forces with extremely intelligent teammates for this series… and failed… starting with a difficult one isn’t a good idea. With each title, we’ve had fun and ultimately completed the challenges, but we certainly haven’t excelled at any. We’ve gotten our money’s worth and I cannot wait to play another one! 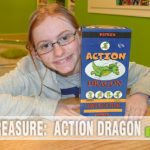 Have you ever tried an escape room game? I have one Exit game on the shelf that I haven’t played yet. I really want to give it a try! 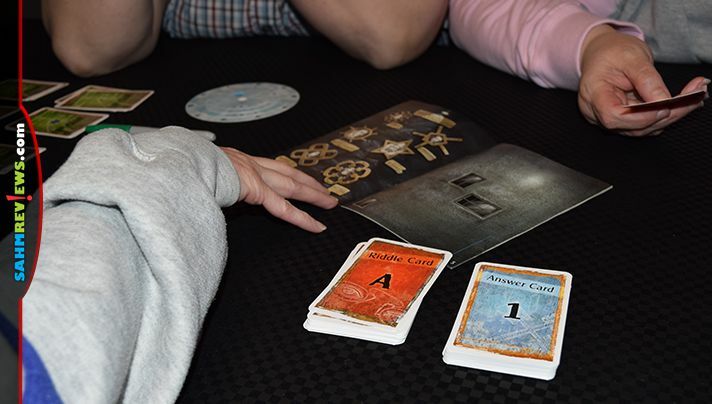 I’ve done and enjoyed escape rooms, but never as an at home board game. Interesting concept. Worth a try! These puzzle games look very fun. Thanks for sharing!